Handmade by Weaver Tile in Horton, Michigan. This tile measures 6" x 12" and is available unframed or framed in either our Legacy or Oak Park frame. 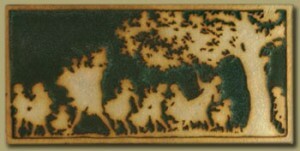 This tile is also available with a detailed tree (see below).